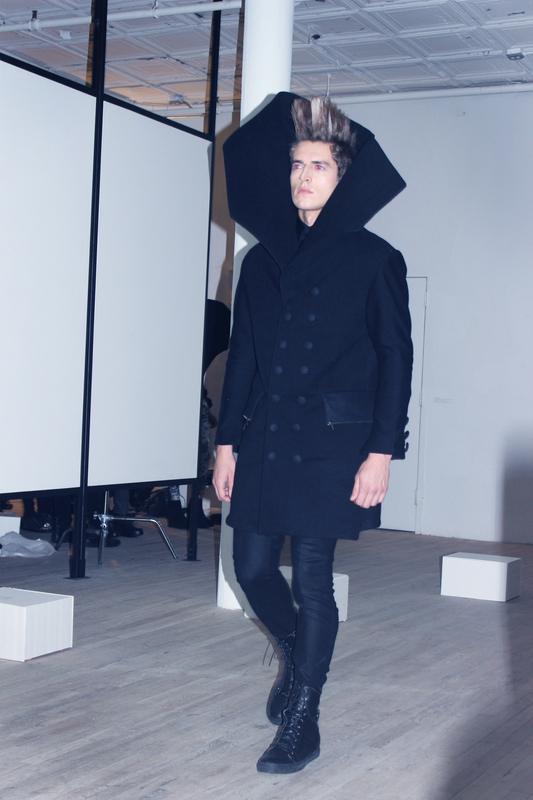 NYFW 13: Long Tran in KM! This fashion week I kept it low-key by only attending just a few events. It feels like last fashion week was just yesterday! 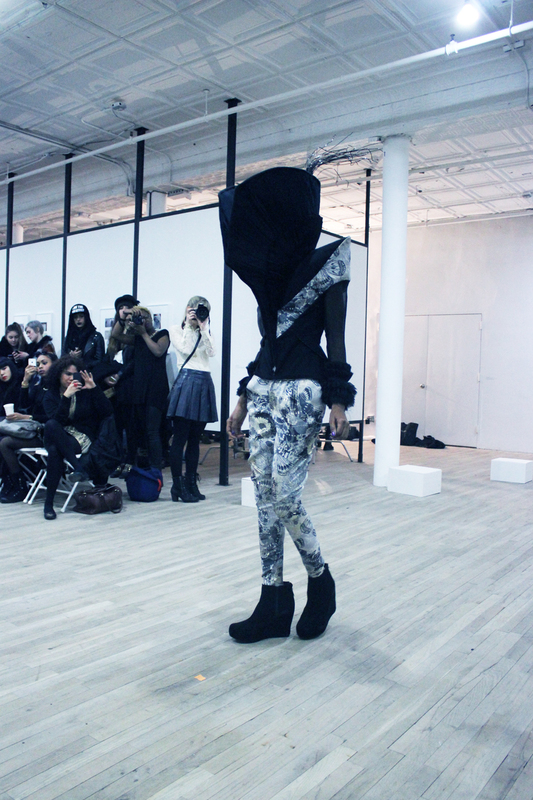 Damn, time really does fly..but for people like me, fashion week is every week. I don’t feel like I need a specific week during the year to allow myself to wear my craziest pieces, I just wear them anyway. Just a few days ago, I left work early to attend the Long Tran show in a Karen Millen dress. It wasn’t anything out of this world on the hanger but after trying it on the print and design of this dress spoke to me in volumes. It was only right that I add a pinch of darkness to it by sporting a sleek bun and a smokey eye. I love channeling my inner goth girl when I am not doing my signature pinup looks. That’s the beauty of not limiting yourself when it comes to fashion, your creativity is endless and you can become a chameleon. Speaking of reptiles ;)…The print on my dress reminds me of crocodiles so I wore it with my vintage patent leather croc belt and Patricia field satchel. I also kept it comfy in some patent leather French Connection pumps. 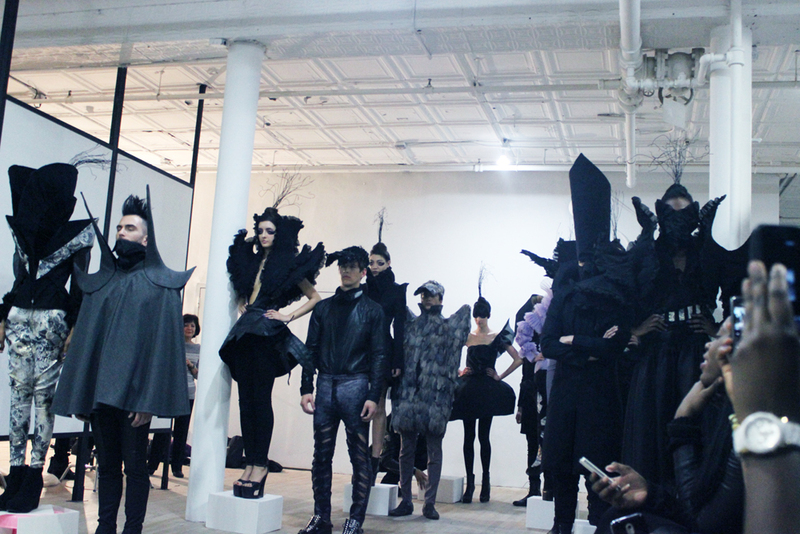 It was the perfect outfit as the theme of the Long Tran show was dark and edgy. 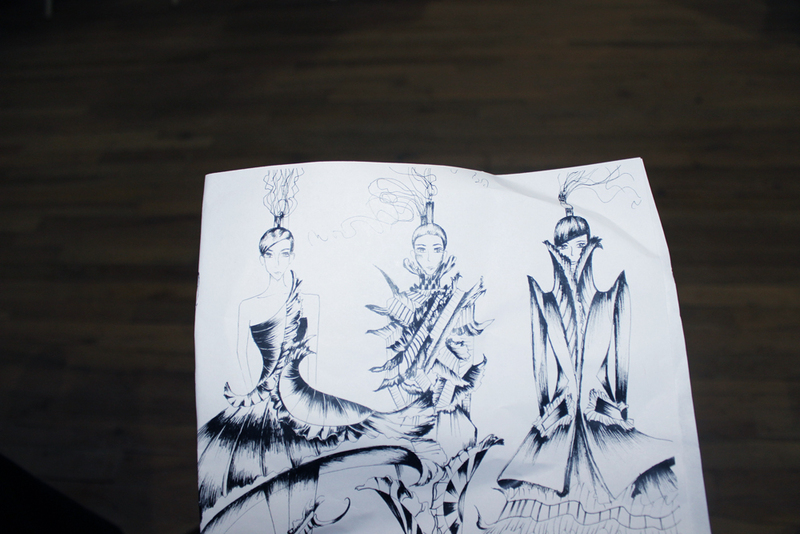 The collection really reminded me of Tim Burton and everyone knows how much I LOVE TIM BURTON. There were trench coats/jackets with high collars, bold shoulders that defied gravity, and masks that turned models into monsters. I was glad to attend and show my support and had a fun time. Black hosiery is essential if you want to sport dresses in the Winter! Love this dress and the harness illusion. I should have painted my nails a different color but haven’t had the time. 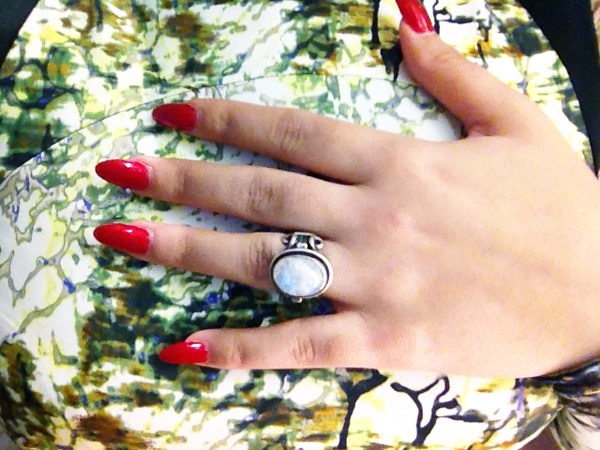 Anyway, this is the cool vintage moon ring I wore with this dress. My comfy French Connection pumps. I gotta keep warm so I wore my Karen Millen pony coat and Betsey Johnson fur stole. 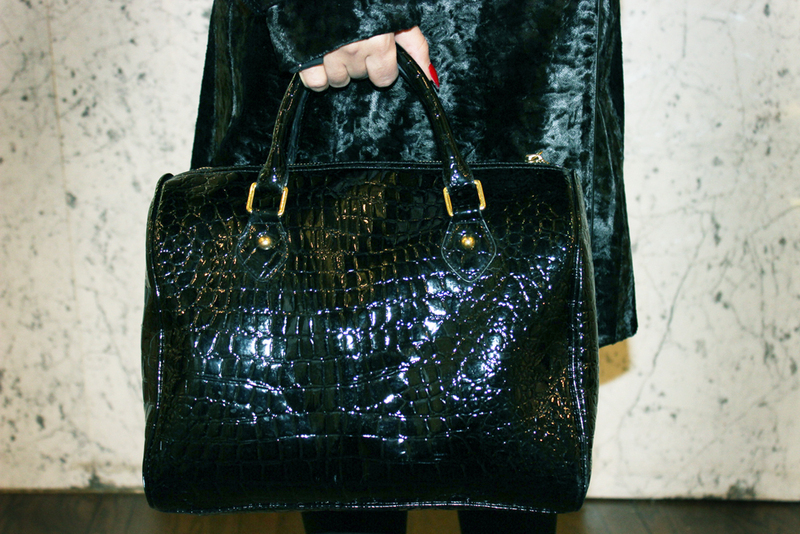 This is my Patricia Field croc patent satchel. Off I go! Long Tran sketches! These are some of my favorite pieces from the show! Love this trench! Crazy but I love the architecture. This skirt is nuts and look at that bolero! So eerie, I love it. XOXO! Awesome! I love the long coat that you wore. 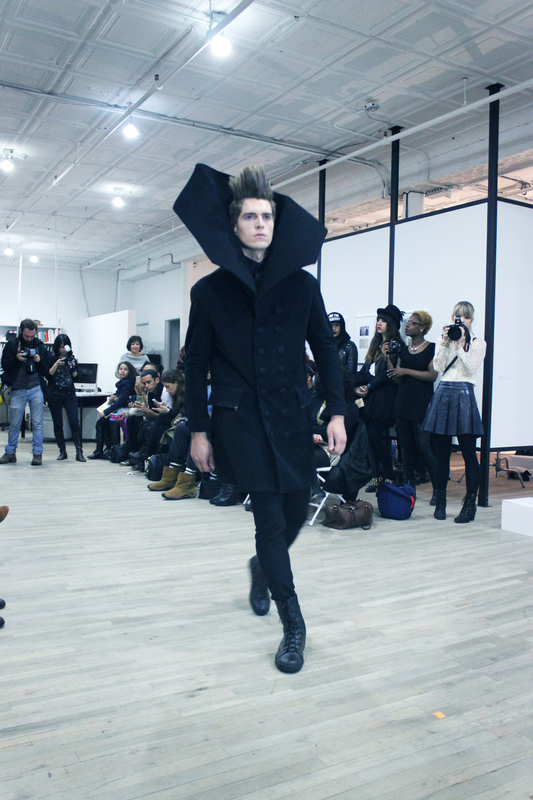 I also like the one with the tall lapels on the male model at the show. I love the black bolero, it’s very Hunger Games Capitol Style. You looked fabulous, as always. I love that your style is so eclectic. You do vintage amazing but can also rock other looks. Your blog has become my favorite fashion blog in part because of this. I love vintage but can’t commit to it everyday because my eclecticness doesn’t want to neglect my other sides (hiphop, goth, boh, etc). I can relate to your style better than most other blogs I come across and always get inspired from your posts. And it always does me proud to see Bronx girls doing well. You’re outfits were fierce!! The fashion show not so much.